Lewis Richard Betterton, 77 of Sparta, Tennessee passed away on Saturday, September 15, 2018, at Saint Thomas Highlands Hospital. He was born Saturday, October 12, 1940 in Atlantic City, New Jersey. Mr. Betterton was a loving husband and a caring father who was devoted to his community with Cherry Creek Volunteer Fire Department. 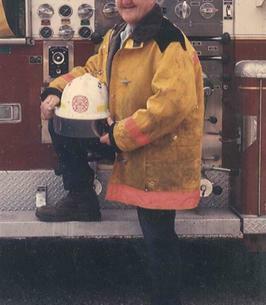 He started the community's fire department in 1984 and completed his service there as Chief, attending every breakfast, shooting match, and other community events. He is survived by his wife, Helene Betterton; son, Lewis Betterton (Bethany); daughter, Victoria Montandon (Matt); daughter, Julie Mountain (Jeremy), grandchildren, Evan , Augusta, Riley, and Dixie Betterton, and Diane Harris; great grandson, Gabriel; son-in-law, Steve Kerpics, and sister in law Dolores Zaloga. He is preceded in death by his daughter, Helene Kerpics and grandson, Ethan. A Memorial Gathering will be held from 4:30pm until 7pm on Friday, September 21, 2018 at Oak Lawn Funeral Home. To send flowers to the family of Lewis Richard Betterton, please visit our Heartfelt Sympathies Store.